Parents, Grandparents, Aunts, Uncles and Godparents the world over should breathe a sigh of relief when they see how easy we make the process of personalizing and ordering this unique Baptism Gift. Our drop down boxes make it very easy to personalize this and all of our blocks. Shopping for such a milestone is not an easy task. This Personalized Baptism Block can be proudly displayed for a lifetime to remind the baptized of the significance of the occasion. 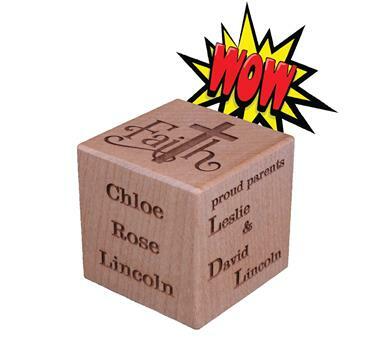 Our 2 inch cube blocks are constructed of solid maple wood and laser engraved to your specifications. Many of our customers choose to engrave Name of the Baptized, date and time of Baptism, Name of Church, Parents' names and/or Names of Godparents/Sponsors. All of our products are handcrafted in Mooresville, IN and we guarantee your satisfaction. All of our personalized blocks ship free around the world! If this isn't quite what you're looking for - please check out our other Religious Gifts. Please remember that our gifts can be special ordered to add your own flare. If you have questions, please don't hesitate to contact us. One all natural maple block, 2 inch cube. Customized for Baptisms, Christenings, and Dedications. Laser engraved details include: Name of person Baptized, Date of Baptism, Name of Church, Name of Parents, Name of Godparents or Sponsors. If a godparent or sponsor is not added then an image of a lamb is engraved on that side. This version is engraved in our Modern Typeface font to match the Typeface baby block. Excellent gift for parents and Godparents. Top is our new Faith with a cross for the t artwork. You are still able to put who it's from on the bottom or your brief message. We handcraft our Baptism Blocks in Mooresville, Indiana USA.